It's been a sober month. Lent started with papal and ecclesial fragility, and my last post spoke of greyness and weariness. 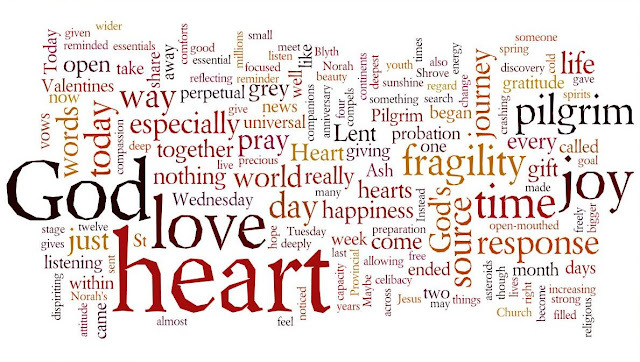 But the Wordle of my February posts reminds me that it all started on a very upbeat note, with two significant anniversaries, in which the God who gives joy and open hearts predominated. So here we are: a Wordle in which "God love heart" leaps out, and where fragility and joy counterbalance each other. Yes, we have "perpetual grey", but - amazingly for a mostly dull month - sunshine is in there too!